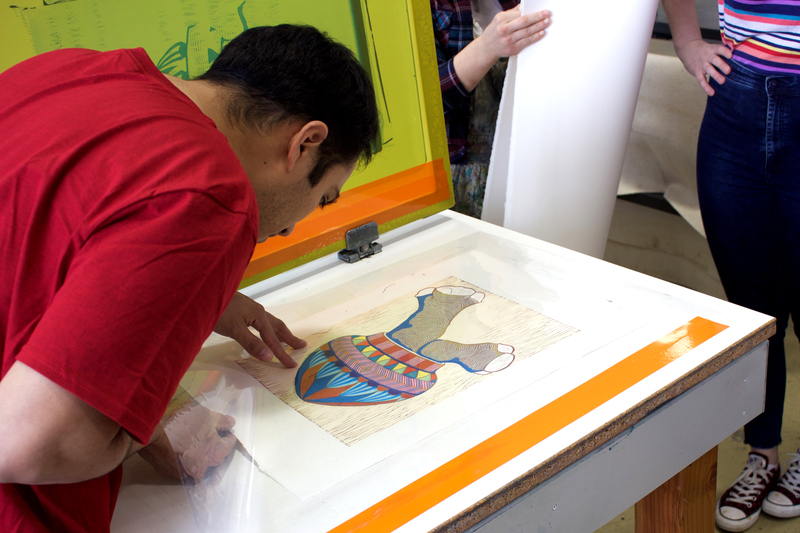 Printmaker Humberto Saenz aligns a piece beneath a removable sheet of plastic to determine where a layer of paint will appear. Saenz is this year’s resident artist for the 2016 Red Press Collaborative installment, working on original pieces from April 4 to 8 in room 4025 in Bliss Hall from 9 a.m. to 4 p.m. This week at Youngstown State University, the printmaking department is welcoming guest artist Humberto Saenz to their seventh annual Red Press Collaborative. The event is an artistic collaboration between students, printmaking faculty and the guest artist for the entire week. 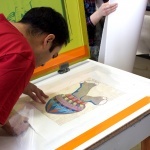 Saenz, an assistant professor of print media at Wichita State University, designed a woodblock etching that is used in the production of a series of limited-edition prints with the collaborative help of YSU students. Joseph D’Uva, a printmaking professor at YSU and leader of Red Press, said that he is excited to be working with his friend Saenz and believes the students who participate gain priceless experience in printmaking. There are many aspects of the process that only the artist can participate in, such as the design or woodcarving. However, for it to be a true collaborative, the students are encouraged to speak up and add to the project. With every new artist Red Press brings in, students can learn new and unique techniques for approaching the printmaking process. 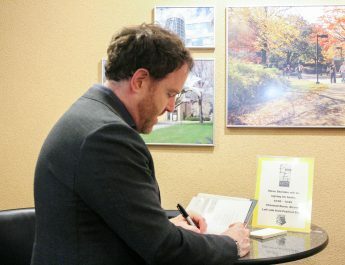 D’Uva said that he wants to expose his students to different artists’ styles, so that one-day they can develop their own style that works for them. D’Uva admitted that he created his style by taking various facets from his mentors and blending them into his own. He wants his students to do the same by observing Saenz. Amanda Durig, a printmaking student at YSU, said she is excited to work with Saenz and observe his techniques. The collaborative lasts from 9 a.m. to 4 p.m. every day in room 4025 in Bliss Hall and is open to spectators. The produced prints are checked for quality, numbered and will be signed by Saenz. After all the prints are signed, and the mistakes are corrected, the remaining prints are divided between Saenz and YSU. The limited edition prints that YSU keeps are available to people who make a $125 donation toward the printmaking department. Along with the prints, the printmaking department will be taking pre-orders for T-shirts featuring a design by Saenz. T-shirts will be sold for $15 or two for $25. The proceeds collected through the donations are saved in a fund for next year’s Red Press Collaborative and other department activities. For more information on prints or t-shirts, contact D’Uva at 330-941-2540 or send an email to jduva@ysu.edu.